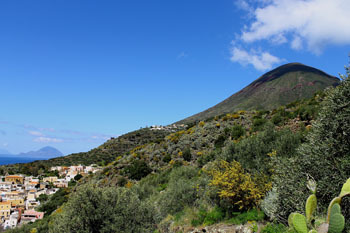 Salina, not without a reason, called the “green pearl”, has the richest vegetation of the whole archipelago, making it an unmissable destination for all the lovers of the nature. 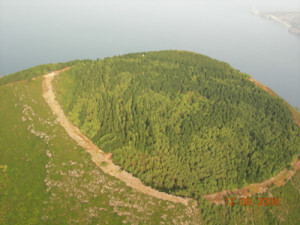 The second island has the first and the third peaks in extension of the whole archipelago; the territory is green even in summer thanks to its mounts’ action, which steal humidity from clouds giving it back to the soil. The climate, milder because of the sea’s action, even in winter period, is sunny , and the temperatures rarely go under 10°C. In spring the nature awakes from the winter’s sleep, which takes its train, leaving place to perfumes , intense colours and all the greens, turning out to be the ideal season to fully enjoy the sparkling nature. 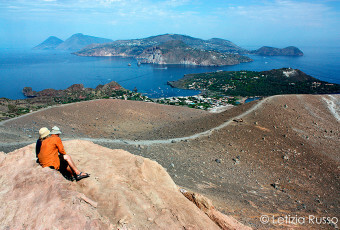 Beyond the note excursions to the Fossa delle Felci craters, to the Monte dei Porri, and the suggestive Brigantino path, various walks can be done on the island. Walking time: 2 hours circa. The highest peak of the whole archipelago, called so because of the namesake lush plant, rises circa 968 meters high upon the sea level; that is why it is not rare to see it covered with snow during the winter period. 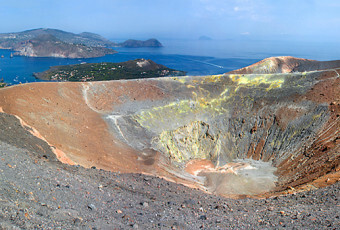 Once reached the peak, a wonderful landscape appears on the horizon: Sicilian coasts dominated by Etna, Alicudi, Filicudi, Stromboli, Panarea, Lipari, and Vulcano constitute a frame for a sumptuousness of the crater, the real demonstration of the volcanic origin of the island. Various are the paths leading to the peak. The most recommended and the shortest one starts at Val di Chiesa fraction, reachable from every point by bus. The tour starts from the Madonna del Terzito Church, where the first stretch is characterized by lush vegetation, composed by heather bushes, chestnut forests, oaks, pines, and broom shrubs, in spring period, colouring the landscape with classic yellow flowers. Going on you will find yourselves upon the hill which separates Mount Rivi and Fossa delle Felci, from which you can admire the picturesque village of Malfa. The distance which separates you from the peak at this point is really short; you will at once notice the mightiness of the crater having a diameter of 600/700 meters, and of a hundred meters of depth. Only now you can fully understand the name of this mount; the crater is crossed by small paths, where you will find yourselves immerged, feeling nearly overwhelmed, by a stretch of ferns. You will be enchanted by this place, a crater circled by old trees, where a sensation of peace and quiet will invade your mind, making you feel like a part of this amazing gift, given us by nature. Walking time: 1 hour circa. One of the most beautiful excursions of the island is surely that which twists for Nero Valley, which after having passed Paolonoce locality, finishes near Vallone d’Ogliastro, through the Brigantino path. 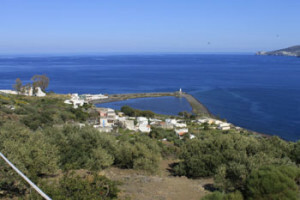 Leaving from the village of Lingua, easily reachable by bus, and after having passed the lake in the south-western direction you will arrive to Sicily Street. Going beyond the last houses of the street, you will arrive to the crossroads where the path once started. On your left you will notice a small beach, where it is possible to swim before a lush vegetation overwhelms you; it is mainly composed of: wild violet, asparagus, tamarisk, aromatic absinthe, arisaro comune, and broom. Once passed the first part, the path narrows going along the mule track, circled by olive trees, capers bushes, and aromatic herbs, enveloping you with their contrasting perfumes. Once seen a small isolated cabin in the south-western direction you will have to cross a wisely terraced part, an evidence of a great work made by the inhabitants, to make rough but fertile soil cultivable. The house of Paolonoce, before visible only in the distance, now is behind the corner, surrounded by a well maintained garden of citrus, olive trees, and vines; from the terrace you can see an amazing view towards Panarea, Lipari, and Vulcano. The house, having a small kitchen, is always opened, and is used as a shelter for wayfarers, who can record their passage by signing the attendance book. The zone is immerged into a surreal silence, only broken by the wind’s swish, which breaks against the trees’ tops, and by the screech of the falcons flying over the ditch.